I have been in love with this product now for over 2 years (right after I was first introduced to it by another YouTube mom), so when Mommy Necklaces offered to allow me to review one of their new designs I was jumping out of my maternity shorts to do so! 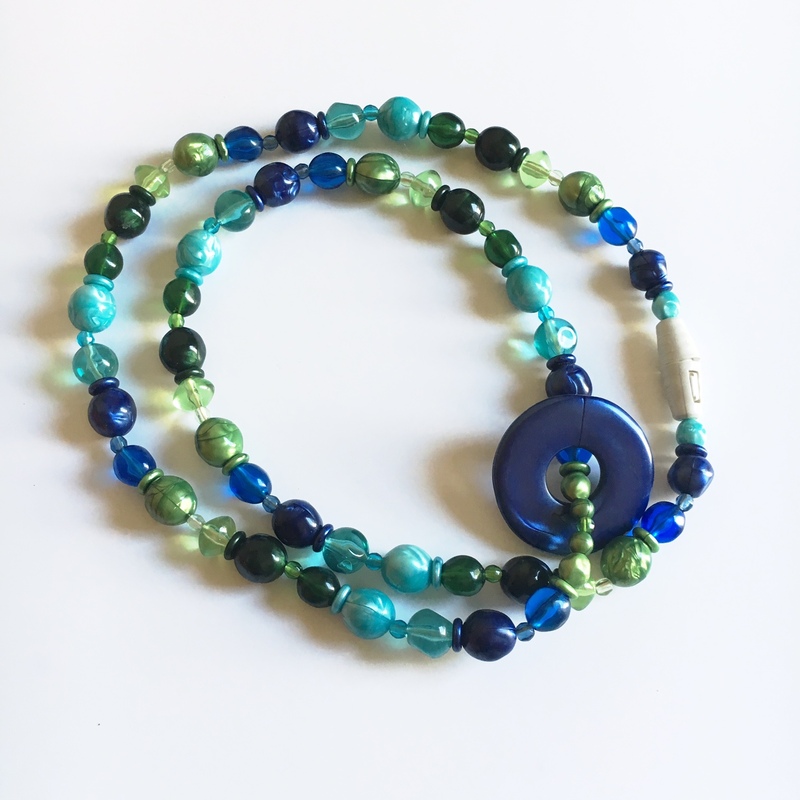 Mommy Necklaces are beautiful, stylish necklaces designed not only to be a gorgeous accessory for moms, but also an engaging necklace for distracted little ones. Made in the USA (in Michigan) from baby safe materials they are an amazing tool to keep little hands busy while nursing/feeding and are the perfect length for doing so. One new feature that I LOVE is that the “donut” can be ordered in a soft silicone teething style for older babies to sooth their gums on. My original purchase (almost 3 years ago) was a dangling donut in the color “Caribbean”. I don’t think this style/color is available anymore but there are SO many gorgeous color combinations on their site. Ezra and then Cora seemed mesmerized by the colors and slight sound and feel the donut made while sliding against the beads of the necklace. I got SO many compliments on the style and when other moms realized it was also a teething/nursing necklace their eyes went wide and they asked where they could get one. I don’t think there has been a time I have worn it that I don’t get some kind of comment of its awesomeness! My newest style, “Promises”, doesn’t disappoint. It has all the same features as my other beloved dangling donut (break away clasp, breakage guarantee, baby safe materials) with the added bonus of coming with a soft, flexible teething donut. GORGEOUS, isn’t it? And if you know me I am TOTALLY into everything rainbow! As a kick off and celebration of World Breastfeeding Week, Mommy Necklaces is going to GIVE AWAY a nursing necklace to one of you! 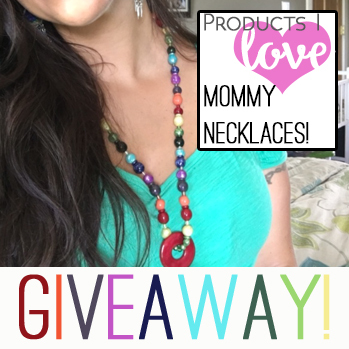 If you would like an opportunity to win a “Promises” necklace just like mine, click on the Mommy Necklaces button below and look through their amazing line of products. Pick your favorite design and then comment on my YouTube review (posted below). I will randomly pick 1 YouTube comment on August 7th (announced on the 8th) to be sent the same “Promises” necklace that I have. I am so excited to bless someone with an opportunity to try out their gorgeous necklaces! Hello, I absolutely love the idea of those necklaces. I have four children, and we are possibly going to add to our family next year. 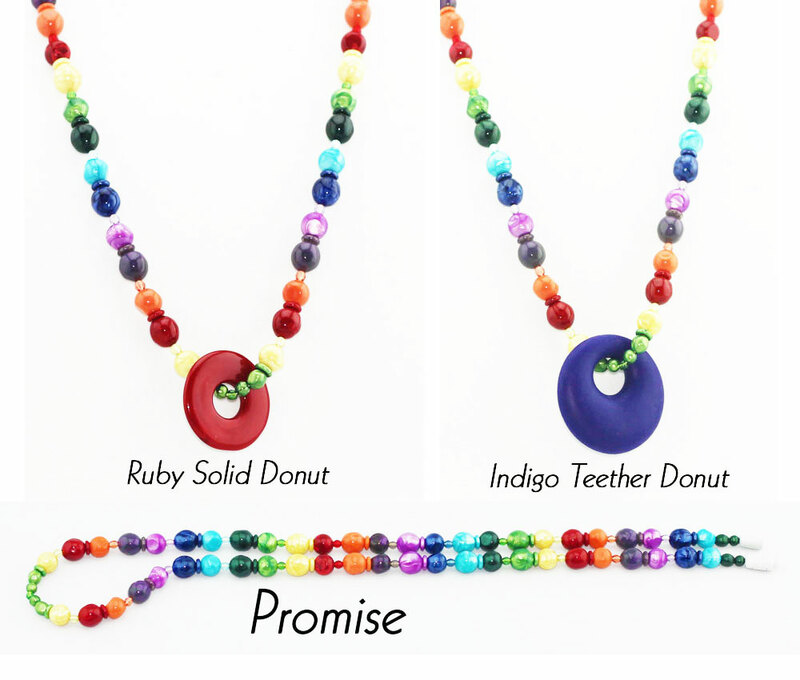 I would love to try the new promise necklace with the indigo teether. I didn’t have much luck breastfeeding my four, and hope that this necklace would bring me luck in successfully breastfeeding our next blessing. Thank you for the opportunity. Maybe you’ll give birth to your darling son on my second daughters birthday; August 11th. Have a great day!